I have a question. What is Agave and why on earth would I want to eat it? According to the side of the box, Agave (pronouned "ah-GAH-vay") is a "plant native to Mexico and the American Southwest. It was a favorite food of the ancient Aztecs and has long been used in Mexico as a natural sweetener." According to Wikipediea (and maybe wisely not included on the cereal box), Agave in various forms can be used to treat constipation, excess gas and arthritic joints. So Agave is a natural sweetener that may save you some serious embarrassment. That's good enough for me. This cereal has a decidedly adult flavor. In a word, it tastes "earthy". The overriding flavor is that of sunflower seeds. The Agave lends a gentle sweetness. If your regular granola is sweetened with sugar or honey and includes dried fruit and/or chocolate, you might find this cereal a bit on the dull side. If you prefer the more wholesome flavor of the health food isle, the nutty-flavor of the sunflower seeds and light sweetness will probably appeal to you. This cereal is unusual in that I'm not sure I would have described it as a "granola". The most prevalent pieces in Agave Plus are puffed rice pieces akin to unsweetened Rice Krispies. A more accurate description of this cereal would be rice krinkles with granola. If you're a fan of sunflower seeds, you should try this cereal. 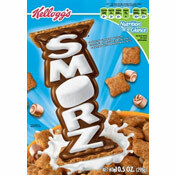 If you're prone to like the healthier options in the cereal isle, this would be an interesting new option for you to try. Nutritional concerns: Each 3/4 cup serving of Agave Plus Granola (without milk) has 250 calories, 9 grams of total fat (1.5 grams saturated and 0 grams trans fat), 37 grams of totals carbs, 4 grams of dietary fiber, 10 grams of sugars and 6 grams of protein. 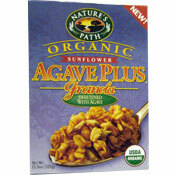 What do you think of Agave Plus Granola? I love this cereal and agree with your review. It tastes very fresh and natural. A great way to start a morning.